The late Professor Edward S. Brubaker ’49 often let loose a deep, rolling laughter in appreciation of a scene well-played—or sometimes one that slipped away from the young actors on stage. “He was as enthusiastic an audience as he was a director, an actor and a teacher,” said Treat Williams ’73, who became friends with Brubaker at Franklin & Marshall. As a student, Williams house-sat for Brubaker and his wife, Mary, when they spent summers at the Oregon Shakespeare Festival in Ashland, Ore.
“I was surrounded by Ed and his stuff, his books, his piano, the smell of his pipe, and I just remember thinking, 'I hope my house has this kind of enthusiasm for learning.' It was just permeating, this kind of love of life that Ed and Mary had,” Williams said. Brubaker died July 15 at his home in Ashland, where he had retired. He was 84. In addition to his wife, he is survived by his daughter, Jenny Black, and generations of students who remember his laughter and his passion for the works of William Shakespeare. Brubaker spent more than four decades steeped in the Oregon festival and acted in, stage-managed or directed all the Bard’s plays. “I left my Shakespeare classes with Ed recognizing that I had been in the presence of deep engagement of the whole person, the mind and the emotion,” said Bruce Maza ’72, who heads a private philanthropic foundation in Louisville, Ky.
A respected Shakespearean authority, Brubaker wrote a handbook for actors, Shakespeare Aloud, and a biography, Shakespeare: A Life in Seven Chapters. The latter came to fruition after F&M alumni, faculty and staff raised money to produce the work independently in 2008. Brubaker was born and raised in Lancaster and graduated from F&M in 1949. He returned as a professor in 1952 after earning a master’s degree in English literature from the University of Pennsylvania. He retired in 1988 as one of the College’s most beloved professors. 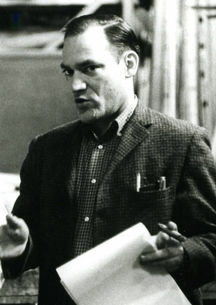 His signature achievement was the founding in 1971 of the Drama Department, which offered a unique combination of academic rigor and theatrical performance. Now known as the Department of Theater, Dance & Film, it was originally carved out of the English Department. Brubaker negotiated the split with aplomb, said Gordon M. Wickstrom, Alumni Professor of English Literature and Belles Lettres, emeritus, and a longtime colleague of Brubaker’s. Wickstrom credits the feat to the respect and confidence Brubaker had earned among his colleagues. “If Ed wanted it, it had to be OK. I think that was kind of the undercurrent of feeling at the College,” Wickstrom said. Along with the late Professor Hugh Evans, Wickstrom and Brubaker formed a triumvirate that oversaw a flowering of the Green Room Theatre and the dramatic arts at F&M. Brubaker started as an assistant to Darrell Larsen, who ran the theater on College Avenue almost as a one-man show. After Larsen retired in 1962, Brubaker took over as director and collaborated closely with Evans and Wickstrom. Brubaker’s expertise was a boon to more than just would-be actors. Students of all majors took his Shakespeare course; it was one of the most popular courses at the College for many years. He was an inspiration to author Floyd Skloot ’69, who cites the professor’s creative influence in two memoirs, The Wink of the Zenith and In the Shadow of Memory. Ed Brubaker’s biography, Shakespeare: A Life in Seven Chapters, is available for purchase at the College Bookstore (717-291-4093). Stan Mertzman's NSF MRI award marks the third NSF-funded equipment award in a row.